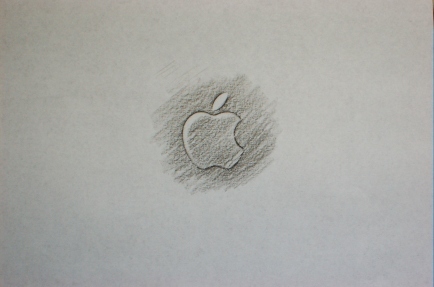 Yesterday, I revisited this post listing on-going projects from December 2009. Some things have changed, some remain the same. The computer stuff has all been crossed-off the list, except that the home server is off-line with a dead power supply (or motherboard). I’m somewhat loathe to spend any money on it, but I should be able to pick something up. While it would probably have been cheaper to buy one of the HF/VHF/UHF combo radios, I’ve set off stupidly down the trail of building (and interfacing) transverters. 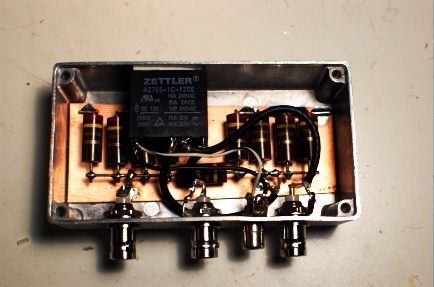 I am just three amplifier stages away from having 3-5 watts on 50 MHz! …plus the interfacing. I’ve decided that interfacing transverters to radios is more difficult than actually designing and building the transverters themselves. I built the 903-MHz W1GHZ transverter during the Winter, but haven’t tried it on the air just yet. W8ISS announced recently that he had some leftovers from the group buy of W1GHZ transverter parts, including boards for 2304 and 3456 as well as some G6Y relay kits. I bought the lot. I have enough MMICs and chip caps in the shop to build these and since I’ll need to order a couple of mixers for the other transverters, I can hit the Mini-Circuits minimum order. Sometime. Microwaves may all get pushed off to Fall and Winter. Through a strange coincidence, my wife and I independently decided that it would be a good idea to move my ham shack. The new location is closer to the center of activity in the house, which means I’ll operate more radio and be more accessible to her while I’m doing it. But, the feedline and rotator cable no longer reach my 144-MHz Yagi. Fortunately, I’ll be able to raid the K8GU coax stash shortly. In the mean time, I’ve been missing what appear from the Hepburn maps to be epic tropo conditions. Stuff happens. QSLing, notably my favorite QSL topic—bureau cards. All bureau requests for KP4/K8GU have been processed. I ran out of CE/K8GU cards with 10 to go. I will run some more of these from a photo printer in the next couple of days. Piles of PJ2/K8GU, K8GU, and (go figure) AA8UP cards remain. I will get the PJ2 cards done this weekend since I have a box of cards on-hand. K8GU and AA8UP cards are awaiting a redesign. Although it sounds like a lot, relatively little is getting done on any of these things thanks to an outdoor project at home. More on this in the future. Jeff, KE9V, posted a note today about all of the bellyaching that goes on over the Hamvention venue at Hara Arena in Dayton, Ohio, also occasional home to Bill Goodman’s North American Gun and Knife Show (“Tell a buddy, bring a friend…Don’t you dare miss it!” the jingle goes). In fact, according to the Hara calendar, it appears to host almost monthly gun and knife shows. But, I digress. I’m delighted that Hara is near my in-laws’ home should I ever wish to make a last-minute appearance—yes, it’s tempting to get in the car tonight. And, I digress farther. The point of this post is to explain the pervasive grumbling, finger-pointing, and misinformation, that spews forth from a vocal minority of the amateur community. I was sitting in 8th grade math class adrift in daydreams as the teacher reviewed yet another topic from a prior grade. Clearly, this was a widely-perceived problem, because one of my classmates persisted in talking to several others around her. Finally, the teacher became so exasperated that he asked, “Young lady, do you have a license to talk?” Of course she did not, but I chuckled noting that, as a newly-minted General class amateur radio operator, I had a license to talk. I tucked that away for future use and went back to whatever it was I was daydreaming about. And today, some 16 years later, the thought sprung into my mind as I read Jeff’s blog. In the not-so-distant past, the primary emphasis in amateur radio was putting a station on the air…Sometime in the ’70s the ARRL stopped calling amateur radio a technical hobby and started referring to it as a communications hobby. In the not-so-distant past, the primary emphasis in amateur radio was communication via radio…Sometime in the ’00s, realizing that it had lost the communications game to telecom deregulation, mobile phones, and the Internet, the ARRL stopped calling amateur radio a communications hobby and started referring to it as an emergency service. So, where does that leave us? Well, we have a technical license exam structure impressed upon a group of people who are enthralled with communication but use the Internet because it’s easier. No wonder anybody who reads about ham radio on the Internet thinks we’re up a creek! I’m going to go make a CW contact or melt some solder to cheer myself up. In the end, we have a license to communicate via radio. Let’s use it. Are you? Objectivity trumps hype. I weighed the pros and cons of tapping the low-level TX and RX lines inside of my FT-840 (the TS-930 brings these to the rear panel) versus installing an attenuator in the TX line. I opted for the attenuator instead of doing surgery on the radio. 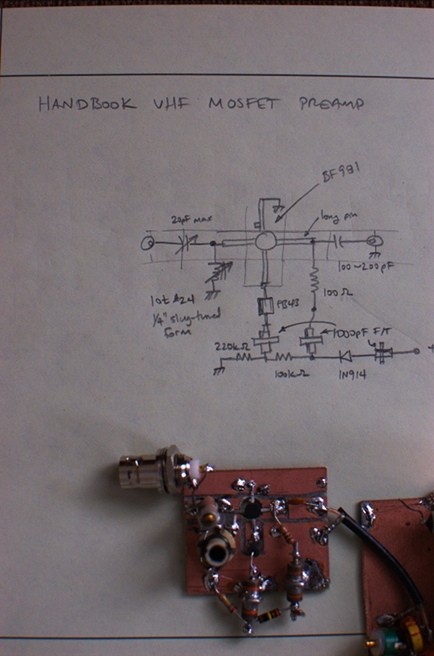 The circuit is not particularly remarkable: the transceiver RF jack goes to a relay T/R switch. The TX side of the relay goes through a hefty 20-dB attenuator to a BNC jack. The attenuator is rated at 5 watts continuous duty and considerably more at lower duty cycles, perfect for this application. The RX side goes straight through to a second BNC jack. The TX circuit is normally closed (and RX normally open). 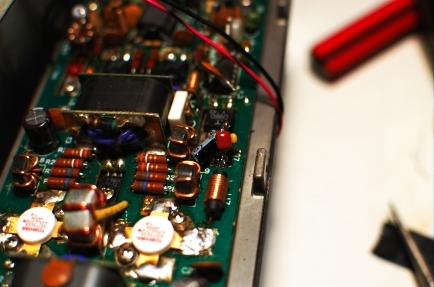 This minimizes the chance of accidentally dumping 5 watts into the RX side of the transverter. Built a little low-noise amplifier for the RX converter today using one of the BF981s I received the other day. 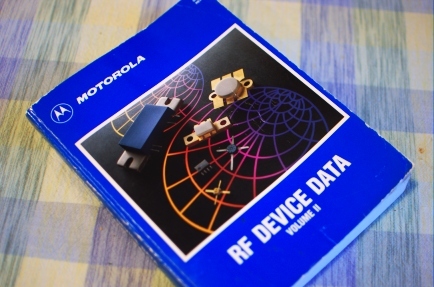 The design is based on the dual-gate MOSFET VHF preamp in the 1993 ARRL Handbook. My local noise level was too high to credibly optimize the match on the beacon alone. But, it did improve my ability to hear it on the 10-meter dipole.